For those of you who do not live in Arizona, it is hot right now. Really hot. Like second-degree-burns-from-trying-to-touch-the-steering-wheel-to-drive hot. This makes it an ideal time to escape to the mountains for a respite from the heat. In just a short two hour drive, we can go from, “I feel like my brain has melted into my feet,” to, “I forgot what it was like to wear long pants and be comfortable.” Aside from the 40-degree temperature drop, camping has so many other benefits – clean pine-scented air, activities that do not involve electricity, time for kids to explore, and cooking everything over an open fire. 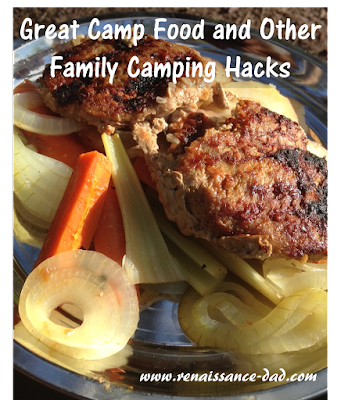 I love camping, and especially camp food! Over the years, and through the dozens of camping trips that we have taken as a family, we have developed some great cheats, or things that make camping a lot easier. Some of these I have seen floating around the internet, but unfortunately do not have the original source. Some of these might be common knowledge, but they seemed like revelations to me. And some of these may be things that we have made up, so all royalties can be sent directly to us. Regardless of where they came from, use what works for you and get outdoors! 1. Foil dinners. My wife and I have made foil dinners for almost 20 years of camping. The premise is simple – take a piece of foil and spray it with oil. Add ground beef, onions, carrots, and celery, along with some onion soup mix. Wrap it all up and seal the foil. Put it directly in hot coals and cook about 20-30 minutes, turning it halfway through. The problem – all of the good stuff on the outside usually gets burned. The solution – cabbage leaves. Add a layer of cabbage leaves on the top and bottom. They help the foil dinner retain its moisture, and they burn instead of your dinner. But that’s fine, since it’s cabbage, and I wasn’t going to eat it anyway. rope through the campfire and then lights the forest on fire. Not cool. So years ago we came up with the doggie zip line. Take a rope and tie it between two trees near the edges of your camp, preferably above head height (you don’t want to clothesline yourself in the middle of the night). Hook a carabiner or similar metal loop around the rope, and attach that to the loop in the leash. Now, your dog can run up and down the zip line without knocking over chairs or getting tangled. Just make sure that the height of the rope and the length of the leash still allow your dog to lie down. Note – if you try to skip the carabiner and loop the leash directly onto the rope, friction will destroy the loop of the leash. Yes, I’m speaking from experience. 3. S’mores alternatives.I love S’mores as much as the next red blooded American, but sometimes I’m just in the mood for a different camp dessert (side note, Trader Joe’s now has marshmallows that are vegetarian (no gelatin) and do not have corn syrup – delicious). We bought some campfire sandwich makers that make great grilled cheese sandwiches. However, thanks to my friend Mary, we also discovered that you can use two pieces of bread and some pie filling to make a delicious dessert pie. Put butter on both sides of the sandwich maker, add the bread to each side, put a dollop of pie filling in the middle, and roast over the campfire. You can also use the sandwich makers, or just the grill/griddle, to make dark chocolate raspberry burritos, which are one of my favorite desserts while camping or at home. 4. Bread on a stick. Okay, so we read about this one in a camping book from the ‘60s. You take a stick and some canned bread dough (the kind that scares a grown man when opening because you never know when it’s going to pop). You wrap the dough around a stick and cook it over the fire. We have never had success with it. The bread is always over done on the outside and doughy on the inside. However, the kids have fun with it, they eat the done bread and then cook the doughy part, and it keeps them busy “helping” with dinner. 5. Lantern made out of a gallon water jug and a head lamp. We tried this this past weekend for the first time, and I was really happy with it. Take a headlamp, and strap it to a gallon water jug with the bulb facing towards the jug. This gives a nice glow that fills a tent and is not as glaring as the headlamp by itself. Downside – you don’t get to look like a coal miner while walking around the campsite. On our drive home today, we asked our kids if they realized how mommy and daddy did not have their phones out at all for the past three days. They said, “Yeah! Maybe you should do that more often.” Camping is an opportunity to explore and eat and breathe and spend time together untethered. Camping is a time to find some nature. 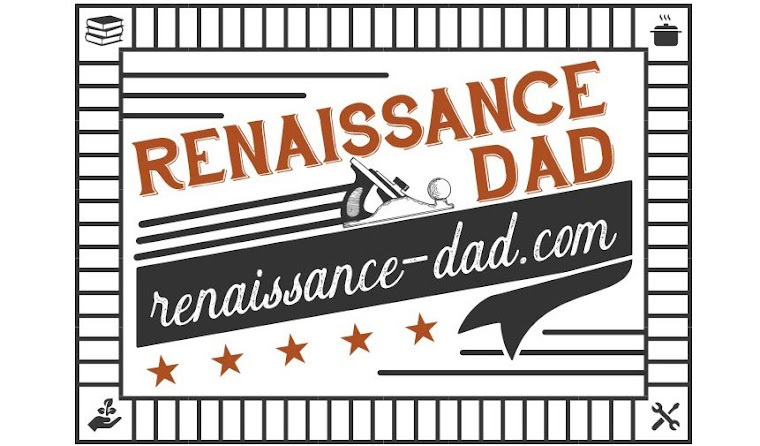 Never miss another Renaissance Dad article. Have every article delivered to your inbox by signing up above. I promise I will never spam you.